‘ĀINA In Schools is a farm to school initiative that connects children to their local land, waters, and food to grow a healthier Hawai‘i. 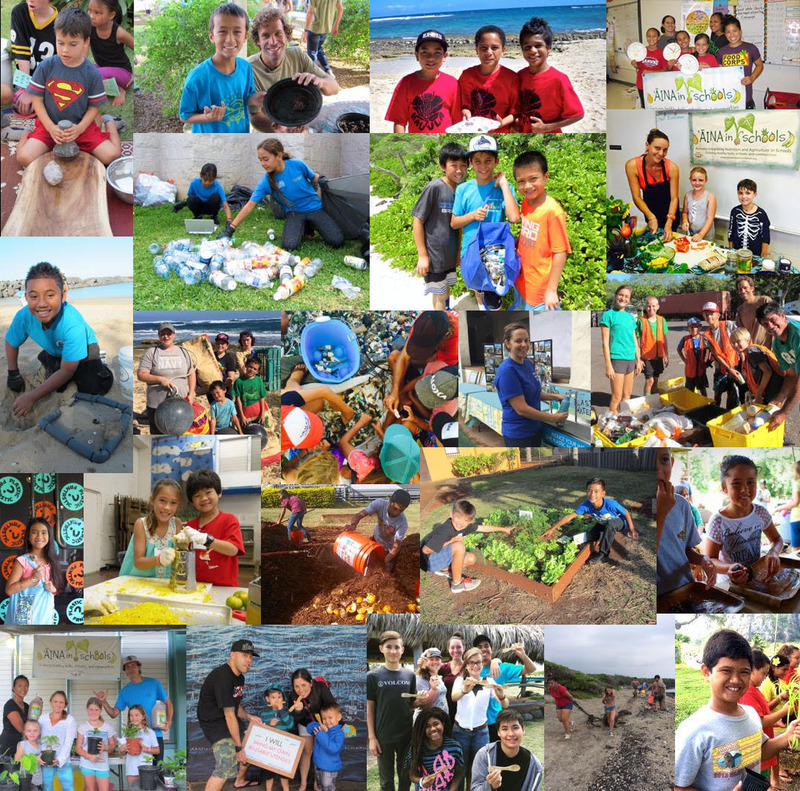 Kōkua Hawaiʻi Foundation works directly with 16 Oʻahu elementary schools that have implemented the ʻĀINA In Schools program. Thirty-two nutrition docent teams led 768 nutrition lessons, reaching 2,156 students, while 54 garden docent teams delivered 1,376 garden and compost lessons to 3,694 students. These docents also shared their time attending docent trainings and shopping for healthy snack ingredients and caring for the school gardens. One hundred eighty students participated in garden clubs. Nine chef partners provided 20 ʻĀINA Chef Visits with 1,617 students making healthy, kid-friendly recipes with local and school garden-sourced ingredients. Kuʻi ʻAi Demonstrations were delivered to 684 students who were helped to pound kalo into paʻi ʻai. ‘ĀINA Schools provided 15 ‘ĀINA-themed educational outreach events including film screenings, cooking workshops, wellness nights, farmers’ markets, and more. Over 950 family, school staff, and community members volunteered at 37 Garden Parties. 133 educators from 100 schools and educational organizations across Kauaʻi, Maui, Lānaʻi, Molokaʻi, and Oʻahu were trained this year to grow the ʻĀINA garden, composting, and nutrition curricula to dozens more schools across the state. 162 teachers, ʻĀINA docents, and parents attended our Farm to School Field Trips for Educators, visiting ʻĀINA schools, farms, and restaurants. To support Hawaiʻi schools in exposing keiki to locally grown foods, KHF partnered with the Hawaiʻi Office of Child Nutrition to produce a second printing of the Hawaiian Harvest Toolkit. Additionally, KHF staff trained 25 culinary arts teachers to use the toolkits with their students. This semester, Kōkua Hawaiʻi Foundation granted field trip support to nearly 11,000 students from 131 schools. Field trip destinations include: Bishop Museum, Halawa Valley, Honouliuli National Wildlife Refuge, Hoʻokuaʻāina, ʻIao Valley, James B. Campbell National Wildlife Refuge, Kaʻala Farms, Kamoku Preserve, Ka Papa Loʻi o Kānewai, Kualoa Ranch, Lyon Arboretum, Mari’s Garden, Paepae O Heʻeia, Volcanoes National Park, Waimea Valley, and many others. Kōkua Hawai‘i Foundation Mini-Grants support teachers and students from Hawai‘i schools in advancing their environmental education goals and pursuing innovative stewardship projects. Over 10,500 students from 95 schools are participating in environmental projects supported by KHF Mini-Grants this semester. Projects include: Aquaponics, Biodiversity of Plants in Hawaiʻi, Campus Beautification: Butterflies & Bird Pollinators, Compost to Garden, Establishing Refuge for Beneficial Insects Using Endemic Plants, Hana Malo Endangered Taro, Healthy Eats, Hydroponics, Recycling Initiative and Environmental Cleanup, Vermicomposting, and more. KHF currently supports 58 schools with their on-campus recycling and composting solutions and is ramping up the 3R’s School Recycling Program island-wide with more recycling supplies and educational resources for schools. KHF continues to work closely with the Hawaiʻi Department of Education, which rolled out a campus-wide recycling pickup program for 176 Oʻahu schools this year. Additionally, KHF hosted 14 Aloha ʻĀina Recycling Drives where over 102,000 pounds of metals, electronics, beverage containers, cardboard, paper, batteries, and oil were collected and diverted from the waste stream. More than 200 student volunteers supported the drives, with proceeds from the sale of select recycled materials going directly to the host schools. Over 800 volunteers participated in Oʻahu beach cleanups, giving more than 2,000 hours to remove over 3,000 pounds of trash and marine debris from our beaches. 650 pounds of this debris be recycled with the Method Ocean Plastic bottle project. PFH educational presentations were made to 2,050 students and 211 teachers at 15 schools. KHF also coordinated visits by Bureo Skateboards to an additional 11 schools reaching 1,700 K-12 students. KHF docents and staff hosted PFH outreach booths at 19 community events. Two PFH water refill stations reduced dependence on bottled water at 12 school and community events, reaching 13,891 people with clean, filtered water. Nearly 13,000 Plastic Free Hawaiʻi reusable bottles, sporks, tote bags and utensil sets have been distributed at school and community events to empower people with tools to live plastic free! This year thousands attended KHF-supported presentations, trainings, workshops, conferences, and discussions. At the North Shore Food Summit, 209 students from 9 schools envisioned and created plans for their community food system. A series of Let’s Ferment It: Homemade for the Holidays Workshops, put on in partnership with Terri Langley from MA’O Farms, empowered participants to create healthy gifts made from locally grown produce. KHF co-sponsored Honolulu Theatre for Youth’s production of H2O: The Story of Water in Hawaiʻi, which nearly 20,000 students and their families enjoyed. The Plastic Fantastic? Exhibit at the Honolulu Museum of Art hosted nearly 16,000 visitors, including 3,000 students, who explored the positives and perils of plastic in our world.